I generally have a low opinion of the latest overpriced, overhyped miracle tool, but this thing really works! It has a row of tiny, sharp inverted Vs that catch the dead hair and pull it out of the coat. It's real charm is the fact that one does not have to stop to remove the hair from the teeth in order for it to keep working. 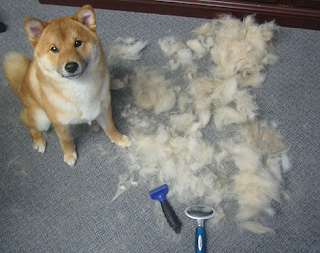 i just recently purchased the Furminator for my shiba. Living in Arizona.. he started a partial blow back in December.. then we had a small cold spell and he's stopped. Oh ma gawwwd what a mess it leaves but... does a much better job of getting out his undercoat in a shorter amount of time. I borrowed this pic for the blog- I hope you don't mind. Will remove if there is a problem- could not find an email address to ask you.